Hey friends! I have been keeping a dirty little secret for quite some time now. And it is called our garage! I am ashamed to say that our garage is sadly neglected, always on the list of things to do, and somehow it keeps sliding down to the bottom of the priority list. Ever since the day we moved in, this has been a problem. We were in a rush to move in (long story) and we kind of just dumped everything in here without any rhyme or reason, and in our haste to get moving, we didn’t even give it a proper cleaning before we put things in our garage. 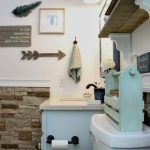 Over the years that we have lived here, this garage has become a dumping ground for all of the things I buy to use for projects on the blog. LC and I have vowed to each other that this will be the summer that we whip this sad space into some semblance of shape, and I am proud to say that we have finally gotten started! 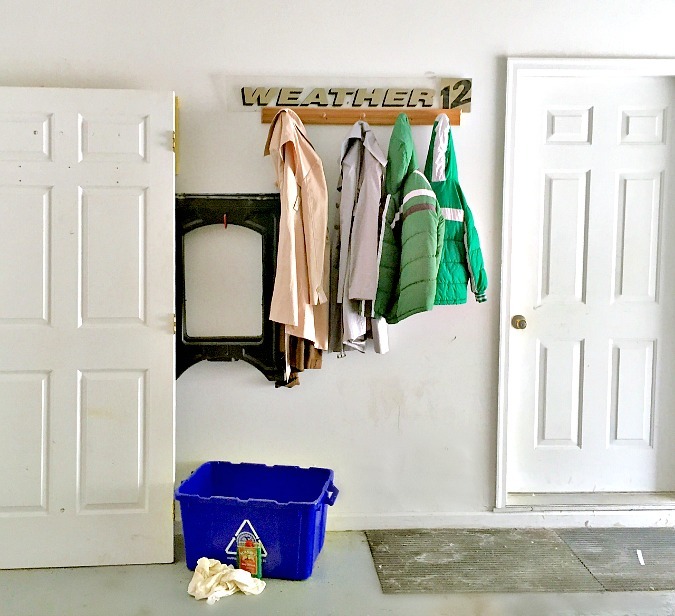 Today I will be sharing just one corner of the garage that we have finally organized and made presentable, thanks to the Rubbermaid® FastTrack® Garage Organization System, The Home Depot, and some good old elbow grease! Getting this one spot neat and organized has truly inspired us to finish up the rest of our garage, and we are so happy about that! I am so excited to be able to share this little corner of our garage with you today! Before we got started on this project, there was really nothing on this wall except for a hook to hang our sawhorses on, and some hooks to hang jackets or what not. And the black door you see propped up to the left was white, and just sitting there. Here is what it looked like before. Sad, right? 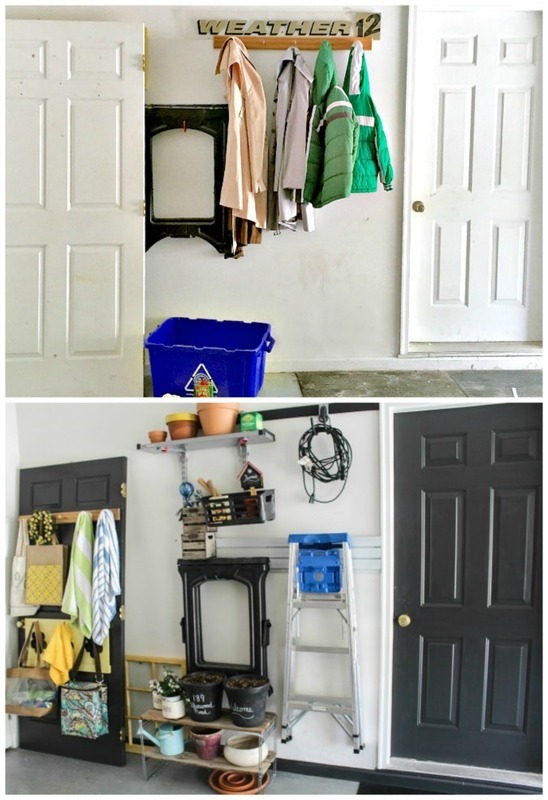 I knew this wall would be the perfect place to use my new FastTrack® Garage Organization System, but I had just one dilemma, what to do with the extra door. You see, the door goes to our downstairs family room. We removed it because we didn’t want our children to be able to close this door when they have friends over #teenagers #wonderwhy. We need to keep the door for when we want to resell this house, so I needed to come up with a plan to utilize this door in our garage, yet still be able to rehang it when needed. I already have a plan to paint every door in our home black, so it came to me one day to go ahead and paint it, and fill it with hooks so that it would be useful to us, and look cute, of course! I thought on this project for several days, and I envisioned it in my head before I began. And I am so happy to say that it turned out just as I had pictured it! The first thing I did was to remove everything from this area, and then I got started painting. I decided to go ahead and paint the door that leads into the house the same color which is Iron Ore from Sherwin Williams. A friend gave me a whole slew of paint samples from when they had painted their interior, and this was a sample that she gave me, so I paid nothing for the paint. I also removed the door knobs, sanded them down, and spray painted them with some left over gold spray paint I had from our recent $5 Chandelier makeover. After I had the doors painted, I decided to go ahead and clean up the baseboards and paint them as well. And now I want to paint all of the baseboards in the garage black because I think they will stay looking much more clean than white. The door you see to the left leads to our storage room, which we organized a while back, and you can read all about that here, and I will be painting it the same color in the near future.We decided to attach the hooks that were previously hanging on the wall to the door. The yellow decorative hooks were a yard sale find many years ago for like $2, and it can be removed easily. I thought about painting it, but then I decided to embrace the yellow, and it worked! I was able to bring in other things we already had that made the colors coordinate perfectly. Right now, we are using our newly created door with all of the hooks as a summer organization station. This is a handy place to hang pool towels to dry, some bags to grab when we are off to the pool, a cooler that I take with me a lot during summer, and a bag of water guns. My dad made me the hanging wooden pegs several years ago, and we had to cut it down by about an inch on each side so that it would fit onto the door, but it worked out perfectly, and we can still hang the door in the family room with this still attached. I decided to utilize this wall to house most of our potting needs because the pots and other items were scattered around the garage with no clear organization. Most of the pots were just sitting on the floor. I had this metal shoe rack sitting in the garage not being used for anything, so I thought it would be perfect to hold various pots. And it just so happened that I had some scraps lying on the floor of the garage from an old fence our neighbors tore down. We used this wood to create our rustic wood wall in the upstairs hallway. The scraps fit perfectly on the metal shelves! I just sat the wood on the shelves, so it can easily be removed, but I am totally digging it this way! Don’t you love it when things unexpectedly work out perfectly? The part of this wall that is the real star of the show is the FastTrack® Garage Organization System. It truly is a wonderful way to get yourself organized in the garage. At first, my husband wasn’t sure about this project because he didn’t know where we would put it, but now that it is finished, he wants to use this system on other walls in the garage as well! He always gets a tad bit grumpy when I tell him I need his help with one of my various projects, but even he will tell you that this whole system is so quick and easy to install! And just look how neat and tidy everything looks! And it is just so versatile, you can hang virtually anything you want with it! In the below picture, I have labeled all of the components of the FastTrack® system that we used for this project. But the beauty of this system is that all of the components are interchangeable, and you can buy whatever pieces you want to suit your own needs. Here, you can see a close up of the Rubbermaid® FastTrack® 48 in. Wall Panel. You will also need to purchase the coordinating FastTrack hardware pack to install the panel You basically just screw the panel into the studs on your wall, so you will need a stud finder to locate the studs. We used our wall panel to hang the Rubbermaid® FastTrack® Multi-Purpose Hook, which is holding our saw horses, and the Rubbermaid® FastTrack® Wall Tool Cradle, which is holding our ladder. The Rubbermaid® FastTrack® 48 in. Hang Rail is the black rail you see hanging at the top in the picture below. This is the backbone of the entire system. The heavy steel construction provides extra durability, and it will hold up to 1750 pounds. You will need a coordinating hardware pack to install it. It is easily installed by removing the black sleeve, and screwing the metal rail into the studs on your wall. Once it is secure, just slide the sleeve back on and it is ready to hang things. We opted to install the Rubbermaid® FastTrack® 25 in. Upright Extension so that we could hang the Rubbermaid® FastTrack® Large Metal Shelf and the Rubbermaid® FastTrack® Utility Bin from it. We secured this with screws to the wall on studs, so it is very secure and will hold a lot of weight if we want to put heavy things up there.I used the shelf to store more flower pots, and the bin holds some seeds, a couple of pots,and my gardening tools. You can easily adjust the shelf and the bin at whatever height you want it to be. They just kind of snap on and off. We used the Rubbermaid® FastTrack® Utility Hook to wrangle extension cords that were laying around the garage. As I said earlier, my husband installed this system for me, but if I had to, I could have done it on my own, that is how simple it was to install. I purchased all of these products at The Home Depot, one of my favorite places to be! 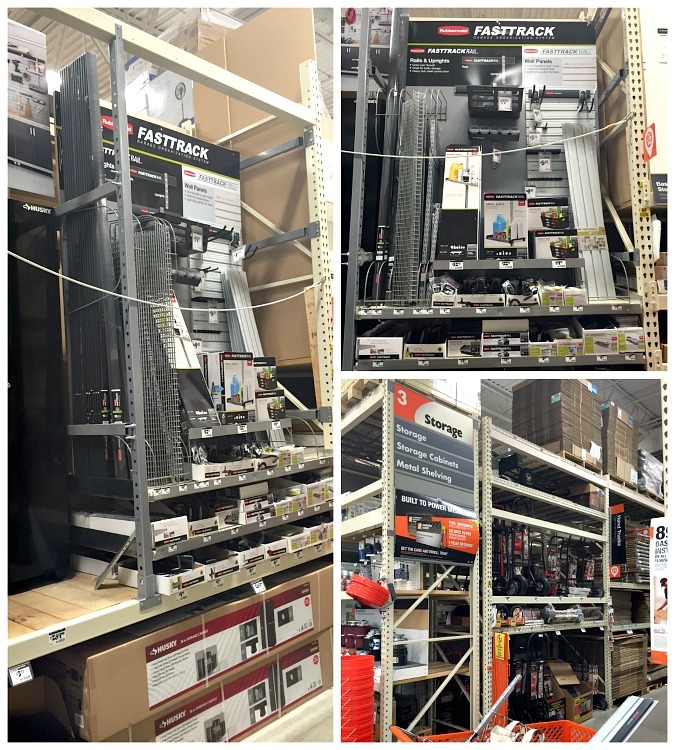 They are located in the storage aisle, and there is lots to choose from in this system. I am so happy that we have a start on whipping our garage into shape! This little corner is something I pass by every time I pull into the garage and go into the house, and it has definitely been brightening my mood since we finished it. And trust me when I say that you don’t want to know what the rest of the garage looks like, but it is very high on our list of things to do this summer, and we are definitely inspired to get it done now that this area is so well organized. So look for more of our garage progress coming to the blog sometime before summer is over! With Father’s Day coming up very soon, the Rubbermaid FastTrack Garage Organization System would make a great Father’s Day gift! What man wouldn’t like to have an organized garage? It’s kind of equivalent to me wanting something pretty and organized for inside the house. Before I go, I have to ask, did you notice the adorable chippy paint yellow window in the pictures? I know you did! A very sweet friend gave this to me a couple of weeks ago! It is actually an equally adorable chippy white on the other side, and I haven’t decided what I am going to do with it yet. So I decided to tuck it back behind my newly painted door full of hooks because it was the perfect pop of yellow in this spot! It is partially hidden behind the door, but it is a 9 pane window, and I can’t wait to figure out what I am going to do with it. I have already been dreaming up ideas! Before I go, let me just give you a before and after comparison, because we all love those, right? I can’t believe how much better and more functional this wall is now! Stuff like this makes me so happy! I love what you did with the fast track organizer. Your garage looks much better. Nice example of a basic minimal organization. Wall systems like the Fasttrack are great. You definitely made a lot more use of that wall space. Nicely done! I honestly think that everything must be arranged properly in the garage. No mess. Thanks for the inspiration!